Without water, human beings can only survive for a few days. When you are out in the wilderness, knowing how to collect safe drinking water can be a matter of life or death. 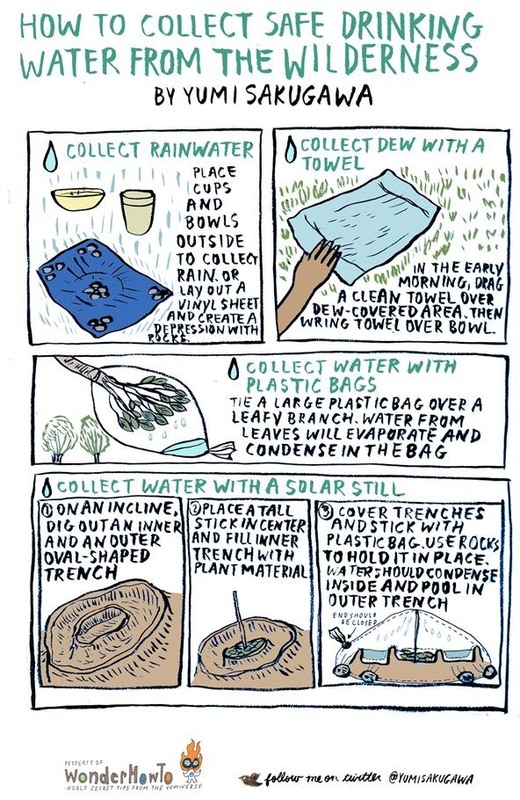 Large plastic bags are extremely handy for collecting condensation from grass and tree leaves, as well as creating a solar still. Dew water can be collected very easily with a clean towel and a small bowl. Large waterproof vinyl sheets are especially good for keeping your belongings from getting wet—and for collecting clean rainwater during bad weather. Got your own survival tips for gathering safe drinking water in the wilderness? Share with us in the comments below. Hmm, well as the outdoors type, I will say that these methods could help you to survive, but they are not "safe" sources of water. Animal-contracted diseases are possible with all but the solar still, so water collected those ways would have to be boiled/filtered/treated. The still-collected water puts you at risk of ingesting evaporate-able toxins, such as benzene or other poisons from the leaves. Hi Mo, as a non-outdoors type, I appreciate the clarification. Thank you for your knowledge! Good stuff to know, I agree with Mo, but if your desperate for water a little contamination is on the back burner whatever the risk. solar still is my favourite. LOVE IT! I have not tried this, but seen Bear Gryls and alike collecting a few drips, here and there and it adds up to clean drink. I have tried a different approach to sort of cleaning water, from the tap. Goes like this. Fill up some clean glass bottles, with cold tap water. Then put it in window and let all the bubbles come and GO. Then pour onto your plants, that HATE CLORINE, etc. Leave the last bit of liquid for ouring away. HEY, HEY, HEY = GARDENERS WATER.